Physicians face numerous practice management challenges throughout their day: EHR use, time management, patient no-shows, and practice efficiency. 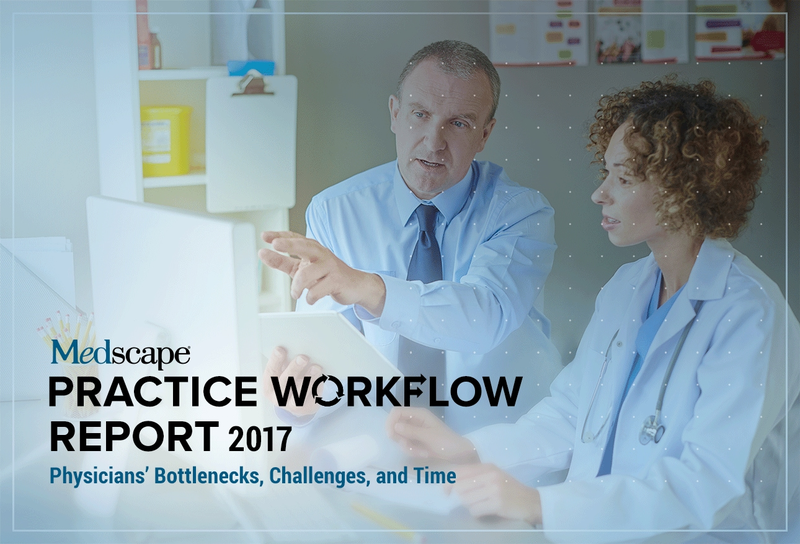 Medscape's "Practice Workflow Report: Physicians' Bottlenecks, Challenges, and Time" is the result of a survey sent to physicians about these and many other practice challenges. Over 1150 physicians across more than 25 specialties responded and provided some surprising findings. Physicians clearly have very busy days. Slightly more than three quarters of physicians see 11 to 30 patients per day, while 40% tally 11 to 20; 14% have a roster of 31 or more patients each day, and 9% of physicians see 1 to 10. Primary care physicians (PCPs) and specialists have many challenges, but not having enough patients is not one of them. Forty-two percent of PCPs and 39% of specialists see 11 to 20 patients daily, while 41% of PCPs and 34% of specialists see 21 to 30 patients. One in 10 PCPs see 31 or more patients, as do 16% of specialists. No-shows can put a dent in a practice's bottom line. In a typical week, the majority of physicians' appointments include up to 10% no-shows. Still, almost a quarter of physicians say that 11% to 20% of their patients are no-shows. Within recent years, it's become more common to phone patients to remind them of their appointment and to charge them for no-shows. Physicians typically fall behind on appointments several times a week or more. Over one third (36%) of physicians fall behind several times a week, while 28% do so daily. More PCPs (35%) lag behind daily compared with specialists (25%), while slightly more specialists (37% vs 33%) fall behind several times a week. Six percent of PCPs and specialists indicated that they are always on time. Although falling behind schedule is often inevitable, it does affect the day. Almost half (45%) of physicians fall behind by 16 to 30 minutes, 37% are 15 minutes or less behind schedule, and 17% create waits of 31 minutes or more. The most common reason for over three quarters (79%) of physicians is their major concern: to spend sufficient time with patients, even if it throws them off schedule. Almost two thirds (66%) say patients contribute to the situation by arriving late and needing to spend time filling out forms. While many physicians inevitably fall behind schedule, there are also many who have found specific ways to stay on time. More than half of physicians are either very or somewhat satisfied with their practice's efficiency. Still, a large percentage think that there is room for improvement and that their practice could operate more efficiently. While some physicians have been relatively slow to adopt new technology, 43% of our survey respondents indicated that better technology would improve their office's efficiency. In second place: more non-physician clinical staff. A leisurely lunch would be a luxury for most physicians. Almost half (44%) of employed physicians and 40% of self-employed physicians take less than 30 minutes. Surprisingly, over a quarter (27%) of self-employed and 28% of employed physicians skip a lunch break entirely. Lunch breaks, if any, are short. Almost half (44%) of specialists and 39% of PCPs take less than 30 minutes. Far more physicians phone patients whenever they find a convenient moment rather than scheduling it into their day. Almost two thirds (61%) of physicians phone patients, but not at a particular time. Despite the increased use of higher technology, the phone is still the tool of choice to communicate with patients outside of the office. Over 90% of physicians use the phone, 34% email, 8% text, and 2% use videoconferencing. Of note: Our survey results showed that twice as many self-employed physicians (13%) text with patients compared with employed physicians (6%). In addition to documenting visits, the EHR has many functionalities that help doctors in their practices. Half of physicians use their EHR to identify patients who need a follow-up visit, and 42% use the EHR to determine which patients need additional treatments. It's worth noting that 12% of self-employed and 4% of employed physicians have no EHR system. EHR vendors have been quick to add dictation and voice-recognition software capabilities to EHR systems, but two thirds of physicians are still not using them, often citing errors and problems with transcriptions. While many physicians find the EHR a burden, they are also increasingly making use of its features that allow several benefits in the patient care realm. Patient portals offer patients and practices many conveniences. More primary care physicians (85%) have patient portals than specialists (78%). Doctors are increasingly offering patient portals, but patients have yet to make much use of them. In 69% of practices with a patient portal, no more than 25% of patients are using them. Twenty percent of practices have no patient portal. Primary care and specialty practices are pretty much neck and neck as far as patients using their practice portals. In over two thirds (67%) of primary care practices and 71% of specialty practices that offer patient portals, a maximum of only 25% of patients are logging on. Patient portals offer a myriad of functions. The three most popular are reviewing diagnostic test results (65%), communicating with clinicians regarding health information (60%), and requesting prescription refills (59%). Most patients have no complaints about physicians' EHR use. Over half (54%) of physicians don't receive negative comments from their patients about using the EHR during appointments. Physicians who do receive complaints tend to get them only occasionally (36%). Only 9% of physicians receive negative comments frequently. In physicians' practices, the full-time medical staff includes an average of 3.6 physicians, 3.6 medical assistants, 1.7 registered nurses, 0.3 physician assistants, and 0.8 nurse practitioners. In physicians' practices, the full-time office staff includes an average of 2.5 receptionists, 1.4 billers and coders, 0.8 office managers, and 0.7 medical record clerks.